A farm to table restaurant outside of Munich provides a delicious escape from Oktoberfest. It is that time of year again when all beer lovers have their eyes on Munich. Either they are here dressed in their finest Tracht and swinging back liters of Augustiner, or they are wishing that they were. In Munich’s fifth season, the city’s population increases threefold and it’s solely because of the world’s biggest beer festival. In other words, for the next couple weeks this city will be pretty crowded. But beyond the city’s borders there are plenty of destinations that make for a good escape. And a culinary escape at that. Herrmannsdorfer is king of Munich’s organic grocery scene. Its beer – Schweinsbräu – is on the shelves of most markets that take food seriously and its bread and organic meats are even more omnipresent. But groceries are groceries and as good as their Weisswurst are the restaurant that the folks of Hermannsdorfer run – Wirtshaus zum Schweinsbräu – is in a league of its own. Less than an hour drive outside of Munich and it feels years away from the table dancing and beer swinging at Oktoberfest. The staff might not be dressed in Tracht, but that doesn’t make this restaurant any less Bavarian. The food is inspired by tradition, but updated by curiosity and the belief that good ingredients matter. This is farm-to-table, Bavarian style, at its finest. Depending on when you visit, you’ll be greeted by a different menu. Handwritten and photocopied, it reflects the time of year with the exception of a few Bavarian staples that are always in season. One is Schweinebraten, an impossibly tender traditional pork roast. In fact, a good way to size up a Bavarian restaurant is to try their Schweinebraten. It is the cuisine’s measuring stick. 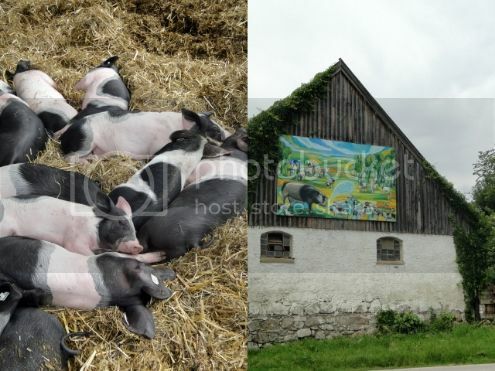 Wirtshaus zum Schweinsbräu prides itself on its happy pigs. The restaurant itself is in the middle of a working farm. How to measure happiness in an animal is up for debate; however, it is clear that the pigs at Hermannsdorfer are treated well, thus following the mantra the better animals are treated the better they taste. One bite of that Schweinebraten and this mantra tastes true. The menu offers a lot more than pork, but with the same attention that the farm showers on its pigs it also gives to sourcing excellent ingredients and developing creative recipes. 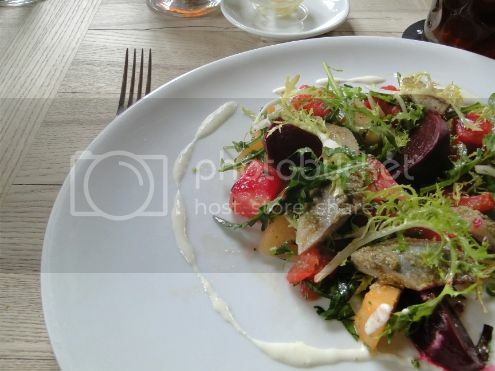 For example, the head chef, Thomas Thielemann, puts quite some thought into salads. The last time I visited I had a salad that was big enough for a meal. It had smoked trout, watermelon, bitter greens, beets and a creamy horseradish dressing. I myself would have never thought of pairing smoked fish with watermelon, but this is a combination of champions. Nestled between the Bavarian capital and the Alps, Wirtshaus zum Schweinsbräu feels like a retreat, almost like a country house that you’re lucky enough to have access to. The restaurant has an elegant interior that doesn’t feel stuffy; making it easy to stay long after you meal has ended. The open kitchen beckons a more transparent approach, where there are no secret ingredients. More than a restaurant, it is an organic compound with a brewery, lots of pigs running about, and a generous garden. Some restaurants you think of just for mealtime. Other restaurants make you want to linger, move in even. Wirtshaus zum Schweinsbräu is an example of the latter. But I can’t write about a Bavarian restaurant without mentioning beer, now can I? 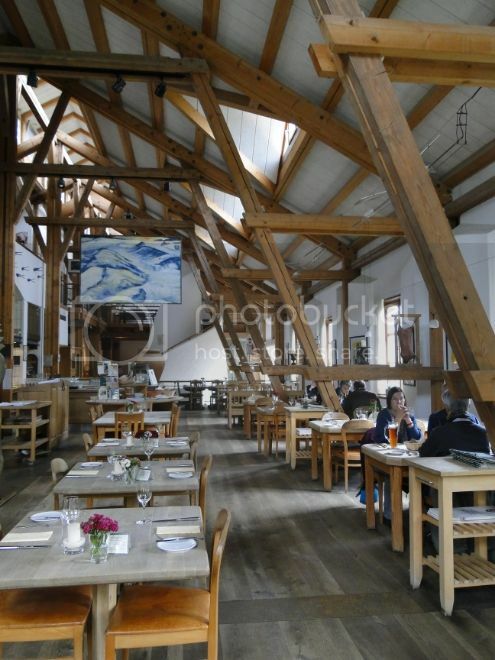 The restaurant shares a large, open room with the Schweinsbräu brewery. Organic beer comes with a higher price tag (as does the food at Wirtshaus zum Schweinsbräu), but here that price tag is warranted. Three regular brews are on offer: Schweinsbräu Gold (a standard Bavarian Helles), Schweinsbräu Dunkel (a dark beer), and Schweinsbräu Weißbier (a wheat beer). They all have deep flavours and taste good with food or on their own. Beer is also an inspiration for food and the kitchen uses it in its pastry dough for tarts. Occasionally, there are beer brewing courses. 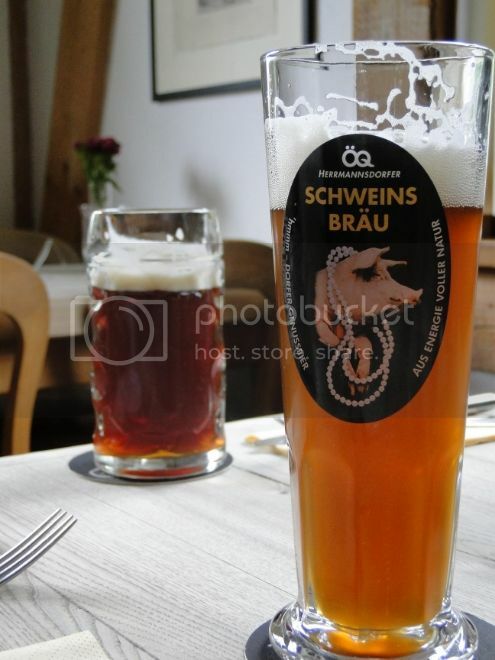 If you need a break from the chaos of Oktoberfest and want a dinner in the countryside, or if you go through post-Oktoberfest withdrawal and fancy making your own beer, Wirtshaus zum Schweinsbräu is a worthy destination.